Cross-fertilizing the Resilience Alliance’s and Transition movement’s approaches to resilience. Hi there, I’m My Sellberg and I’m doing a PhD in sustainability science at Stockholm Resilience Centre, Sweden. The exciting and uncomfortable space between science and practice is where I want to be. I think it suits me because I want to both learn and do. I want to contribute to the transition to more sustainable pathways for our societies and not just by observing and describing the problems at hand. I want to be part of the solutions. Trained in social-ecological resilience thinking, I soon realized that it contains lots of interesting concepts and theories but how could they be used? That was how the Resilience Assessment caught my interest. Basically it is about jointly defining and understanding a problem in a particular natural resource setting and coming up with suggested actions. It uses the resilience thinking lens, including its view of how people and nature are deeply intertwined; how the consequences of our actions are often complex and uncertain; how change happens in dynamic and sometimes abrupt and unexpected ways; and how different scales are connected, from the very local to the planetary. This view of the world intuitively resonates with me. In my work I have been exploring how these ideas can be used in the strategic planning of municipalities and regional organizations. The specific project that I wanted to share with you is a novel cross-fertilization between the Transition Movement’s approach to resilience and that of the social-ecological resilience assessment. 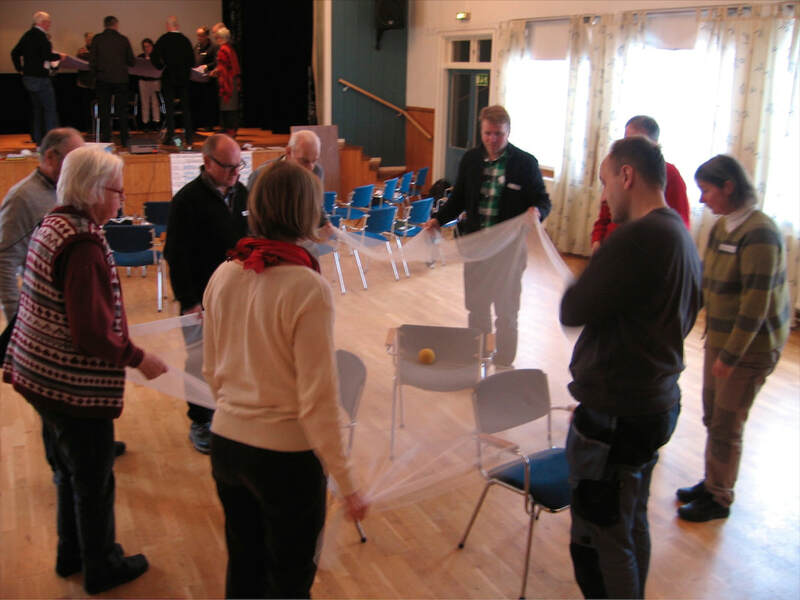 It all started with me being contacted by Hillevi Helmfrid and Daniel Hägerby, two ‘Transitioners’ who at that time were working in a regional rural development organization in Southern Sweden called Astrid Lindgrens Hembygd. Hillevi and Daniel wanted to do a resilience assessment but one that asked how a community can be resilient in the face of climate change, ecological and economic crises and major social inequalities. I wanted to see how resilience assessment could be improved so that it better addressed the need for societal change. Surprisingly there weren’t many collaborations between transition and resilience research, although transition is influenced by social-ecological resilience thinking among other things. To us it seemed like a perfect match. During the spring of 2014, Hillevi, Daniel, and I embarked on a learning journey together. We planned and performed three workshops with different local communities in their region. We also wrote a booklet which briefly explained resilience and presented a set of principles of resilient systems that could be used for a quick self-assessment. I also interviewed Daniel and Hillevi, and compared the handbooks of the Transition Movement and the Resilience Assessment. So what did we learn? We found a common interest in conveying the ideas of complex systems and complementary strengths in the Transition Movement’s pedagogical group exercises and the Resilience Assessment’s concepts and simple thought models. We also found the resilience assessment process useful, as it guides participants through asking different questions: what is it that we want to be resilient? To what type of changes? So what? What do we want to do about it? It provides principles and ideas to interrogate what resilience means for a specific community, acknowledging that there will always be aspects that are context-dependent. The most important lesson for me was how the Transition Movement provided a narrative and a purpose for doing resilience assessment that opened up more for change. For example we used ‘context cards’ to see how local communities were connected to the planet and to large-scale crises, and focused on the resilience of basic human needs to challenge the current structures for providing for those needs. What happened afterwards? For the communities a one-day workshop was not enough to make any bigger impact and the results were not taken up in the strategic planning of the regional rural organization, mainly because of a lack of anchoring. However, our project will have an impact on the development of the resilience assessment method. A new, updated version is being developed as we speak. Earlier this spring a paper about the project was published in Ecology and Society. Personally this project has definitely influenced my way of understanding and applying the resilience assessment method. The big question now, I think, is whether our lessons can be brought into the wider Transition Movement. Could we do resilience assessments with local Transition Initiatives? Would that be useful for them and how would it fit into the broader social learning process they are engaged in? How could ideas of complex systems be introduced in Transition trainings? Our project showed that there is a potential for mutually beneficial collaborations between resilience researchers and Transition Initiatives and I hope for a continued dialogue and engagement between our two communities.